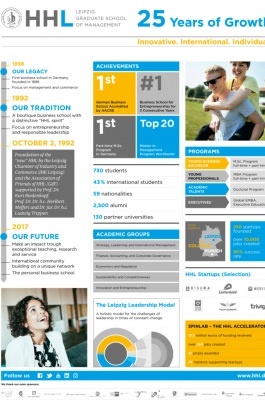 In 1898 “Handelshochschule Leipzig” was founded as the first business school in Germany and focused on Management and Commerce. 25 years ago - on October 2, 1992 - the “new” HHL was re-established with the entry in the Commercial Register by the Leipzig Chamber of Industry and Commerce (IHK Leipzig) and the Association of Friends of HHL (GdF) supported by Prof. Dr. Kurt Biedenkopf, Prof. Dr. Dr. h.c. Heribert Meffert and Dr. jur. Dr. h.c. Ludw Trippen.